Today we had a thrilling, exciting Table Topic Contest. and Interviewer after a long time absence. 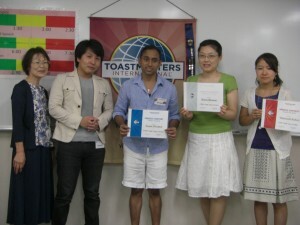 In-house contest, though, I felt nervous on the stage. 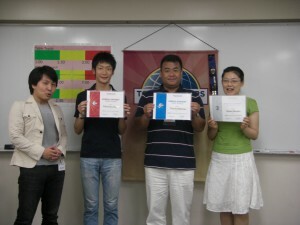 But to our amazing, we had 10 contestants in English and 6 in Japanese. In-house contest filled the laugh, stimulation and hotly competition. 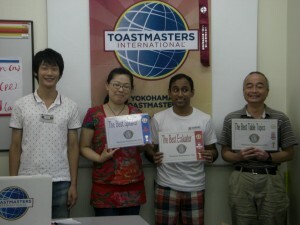 I believed we all enjoyed Table Topic In-house contest. Thank you, all contestants, assistants and audiences. It was a first day of September, but it was still very hot and humid day. The 535th Meeting started with a great announcement by President Matsuzaki. YTMC was given the ribbon of president distinguished club!!! We had a great honor!! Wow. The today’s TMOD was TM A.T who is the youngest member in YTMC. 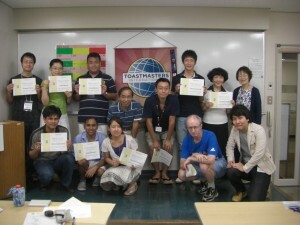 For the audience (listeners), we are able to learn many things through their speech. This is the one of the interesting and valuable points on YTMC! not able to finish within the time limit…. Yes, time management is always very important in YTMC. Next meeting on Sep 15th is In-House contest!! We are so excited it! 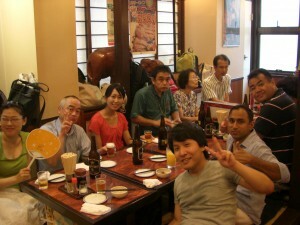 Please be sure to join Danjyo Kyodo Sankaku Senter Yokohama-minami ! !